GRAND RAPIDS, MI - Beacon Hill at Eastgate is breaking ground Thursday morning, July 16, on a $30 million expansion that will add 150,000 square feet of space. Demand for independent-living apartments for seniors is driving much of the expansion, which will increase the size of the retirement community by 50 percent, Chief Executive Officer Jeff Huegli. Most of the new space is devoted to 56 new one- and two-bedroom apartments. A new building for the skilled nursing center will allow the home to convert its skilled nursing suites to private rooms and provide space for short-term therapy clients. And 10,000 square feet will accommodate new dining space. The growth comes just five years after Beacon Hill opened 114 apartment homes on its 22.5-acre space at 1919 Boston St. SE. "We're full to the gills. We are probably two years ahead of our projected performance," Huegli said. The expansion also includes facilities that will further connect the retirement community to the surrounding Eastgate neighborhood, Huegli said. A 250-seat Center for Arts and Worship will be built on the north end of the property and made available to local theater groups, faith-based programs and events. 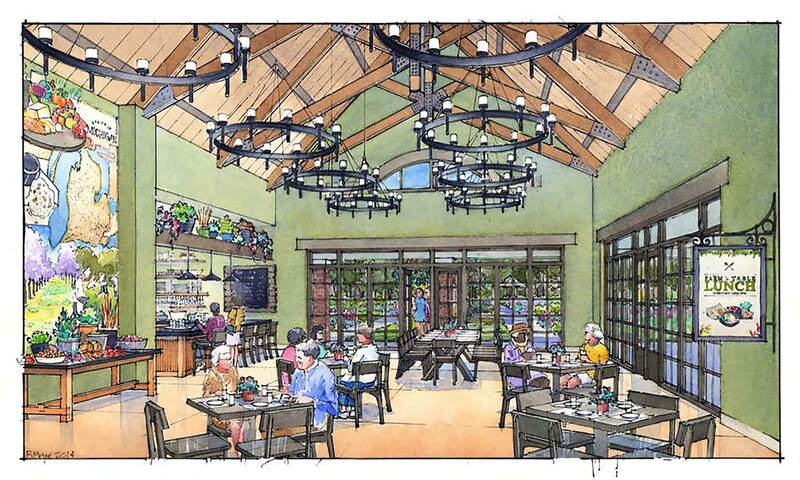 Near the auditorium will be a Garden Cafe, which will be open to outside customers as well as residents. "It won't be Applebee's. We won't advertise on the street we have meals for everyone," Huegli said. "But our neighbors can walk over in the morning and get a latte and a beignet and have breakfast. "It's a way for our culinary team to express themselves and grow." The dining service, led by Executive Chef Timothy England, draws on food grown in a garden on the property. The garden provides about $110,000 in food value to the dining service, Huegli said. Garden plots also are available to residents and some community members. Beacon Hill has been increasing its outreach with the neighborhood in the past few years, Huegli said. It launched a 5K race and expects 600 guests at its community picnic in August. In addition to the new buildings, a bridge will be built linking the skilled nursing center and the independent-living apartments, to make it easier for staff and residents to travel back and forth. The nonprofit, faith-based retirement community is rooted in Michigan Christian Home, which opened in 1960 at Plymouth Avenue SE and Boston Street as a ministry started by five Baptist churches. After next-door neighbor Metro Health moved to Wyoming, the home acquired the hospital's 12.5 acre site in 2006. The organization was renamed Beacon Hill at Eastgate, which is open to residents of all faiths. The growth will bring Beacon Hill from 225 beds to 281 beds. Although some expansion may occur in the future, Huegli said there is no plan to reach the size of the largest retirement communities in the area. The new apartments will be 1,200 square feet and will include underground parking. Fifty of the 56 apartments already have been sold, Huegli said. The expansion is being funded by privately financed bonds and designed by PRDG Architects, with landscape and planning provided by Progressive AE. Beacon Hill also announced the formation of the Beacon Hill Foundation, which will focus on providing support for residents in need, community engagement and capital projects. Sue Thoms covers health care for MLive/The Grand Rapids Press. Email her at sthoms1 or follow her on Twitter, Facebook or Google+.